VOICES OF STAGG is a story about the power of storytelling in helping us understand each other as human beings. 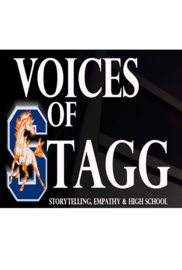 An unprecedented classroom experience serves as the backdrop for VOICES OF STAGG, a touching and brave look at one school’s journey to use storytelling to build a more empathetic high school culture. A journey inspired by the kind spirit and stories shared following the loss of beloved teacher Mary Ogarek at the age of 33. High School students bravely open up about their own vulnerabilities in creating a learning environment where the answers aren’t defined by the teachers, but rather by the human experience, Lisa Thyer and Chris Wendelin facilitate 60 high school seniors in learning about themselves, about those around them, and about the really hard work of publishing a book. Many of the lessons learned are from the students themselves as they take the reigns of their learning, open their minds and their hearts to hear and tell others’ stories, and become published authors at the age of 18.